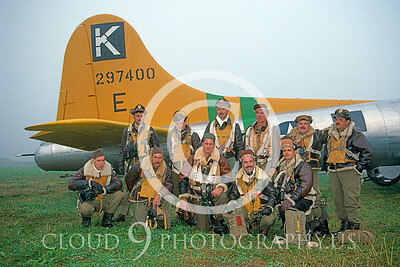 A collection of aircraft pictures that show reenactors in aircrew dress in or around military airplanes. These reenactment airplane pictures are like being on a movie set that recreates the past. Cloud 9 prints are "the real deal"--real photographs of real airplanes. These originals are detail rich high resolution large files that make excellent, big, prints that command attention. Ideal for pilots, their relatives and friends, wannabes, collectors, and aviation enthusiasts. Detail in Cloud 9's big prints is amazing. Excellent for room decoration or as an unique gift or both. These are not Walmart posters or cheap inkjet prints on thin paper.